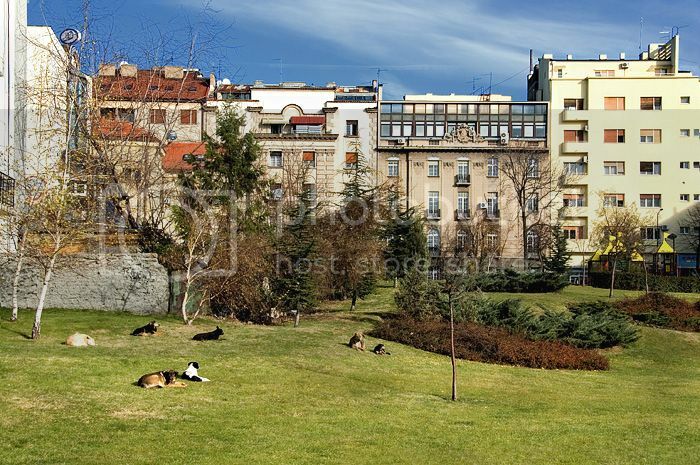 This is a pack of stray dogs at the park at Mitic's Hole near Slavija Circle. Which one do you think is the pack leader? From my observations it's the tiny one, who's furthest on the right. Speaking of stray dogs in Belgrade, if you want to help out please visit Katya's Dogs. I agree about the leader! All the noses seem to be pointing toward that little one's direction! And there seem to be so many strays! Very unusual! Strange about the timing of your other photo. At times, I often wonder if we really do know more than we allow ourselves to know! And thank you for linking to Katya's Dogs! Come by to celebrate my anniversary today. It is sad. I hope they all make it and find good homes. Interesting photoblog, greetings from Warsaw! So many stray dogs in one place. I am sure they are dangerous also. When stray dogs get hungry they can attack humans especially children. In some towns in India this has happened. Hungry stray dogs attacked a small school going child and killed him. Dog lovers here want to get them castrated. Why are the authorities not impounding them? stray dogs in an urban center? Wow. Fantastic beuaty shot! Great shot and it proves that the littlest can truly be the biggest.